The world was wide open and I felt like such a big kid, finally in school for a full day unlike those babies in kindergarten. I was fortunate as a kid because my parents took me to every museum, zoo and historical site across Ohio. So, by the time I started school, I felt like I was ahead of the game. The Cleveland Metroparks Zoo was an amazing place. 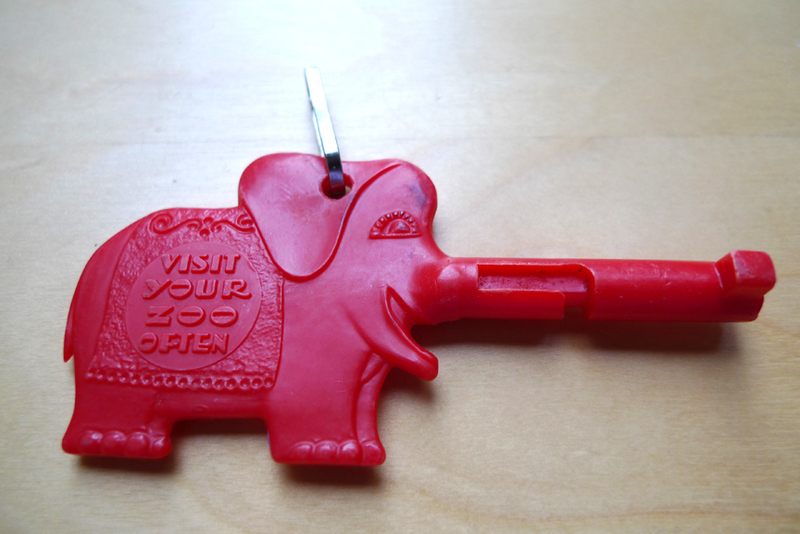 With Monkey Island, elephant rides (yes, you actually used to be able to do this) and my favorite thing ever...the Zoo Key. Outside of certain attractions there were these rusted out orange metal boxes. You would put your Zoo Key in and turn and Linn Sheldon (Barnaby) would tell you about that particular animal. It was a fantastic piece of marketing. The Zoo sold the Trunkey for 50 cents or a dollar and kids begged their parents all summer to go back to the Zoo. The night before our field trip, I carefully took my elephant out of my jewelry box and tied it around my neck with thick, soft red yarn. I couldn't take the chance of forgetting it in the morning. I slept with that think around my neck, dreaming of the day ahead. That day didn't disappoint. I remember being the only one in my class with a key. To the surprise of my classmates, I glided up to each box, almost strangling myself with each turn of the trunk. We all huddled against the splintering wood fence to hear about the lions and tigers. I loved that key. More importantly, I loved all of the family outings that came out of my begging and pleading to use it just one more time.